CBP–siRNA reduced the nuclear levels of CBP and impaired LTF. A1, Western blot analysis of nuclear extracts from Aplysia CNS revealed a single band with a molecular weight appropriate for CBP. 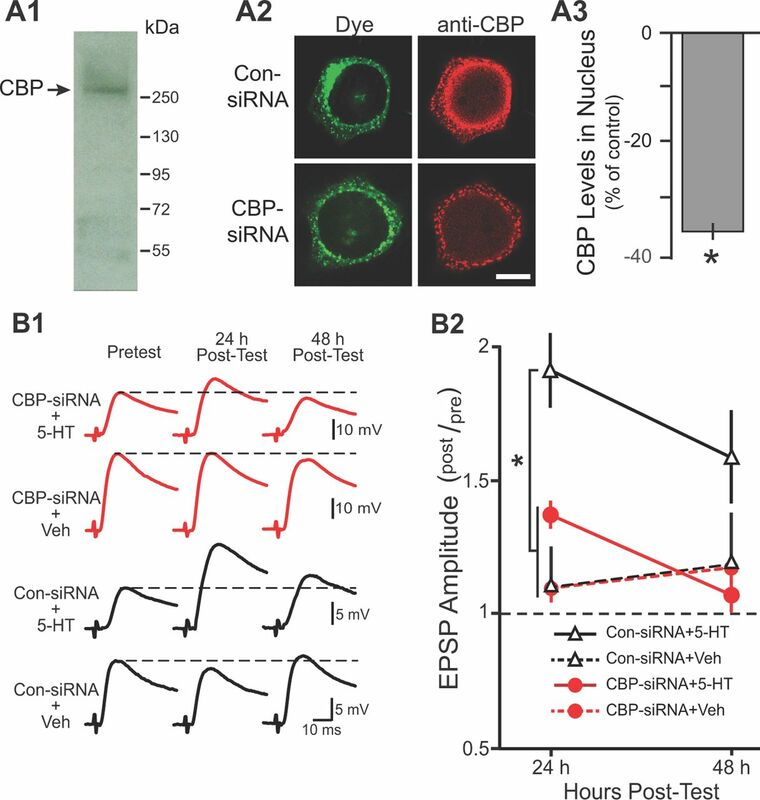 A2, Representative confocal images of CBP immunofluorescence in SNs 96 h after injection with either Con-siRNA or CBP–siRNA. Fluorescein dye was coinjected to verify that SN cytoplasm and processes (but not the nucleus) were filled. Scale bar, 20 μm. A3, Summary data. CBP levels in the nucleus of SNs were significantly reduced 96 h after injection with CBP–siRNA compared with SNs injected with Con-siRNA. B1, Representative EPSPs recorded immediately before (Pretest) and 24 and 48 h after (Post-Test) the standard protocol. Dashed lines represent the amplitude of the pretest EPSP. B2, Summary data. Synaptic plasticity was measured as the ratio of posttest to pretest EPSPs (post/pre). Significant differences among treatment groups are indicated by *p < 0.05. Model of a molecular network necessary for LTF. A, Gray shading indicates components of the model originally developed by Zhang et al. (2011). The model was extended by incorporating CREB1, CREB2, C/EBP, and CBP. Phosphorylation of CREB1 and its subsequent binding to CBP were assumed necessary for induction of c/ebp. Unphosphorylated CREB2 repressed c/ebp. Phosphorylation of CREB2 removed this repression. Arrows and circles indicate positive and negative regulation of transcription, respectively. B, C, Simulations of the standard protocol with normal CBP levels (B) and with the CBP knockdown (C). The rescue protocol with the CBP knockdown boosted pC/EBP levels beyond control levels (dashed/dotted line) (D). Simulating CBP knockdown and rescue. 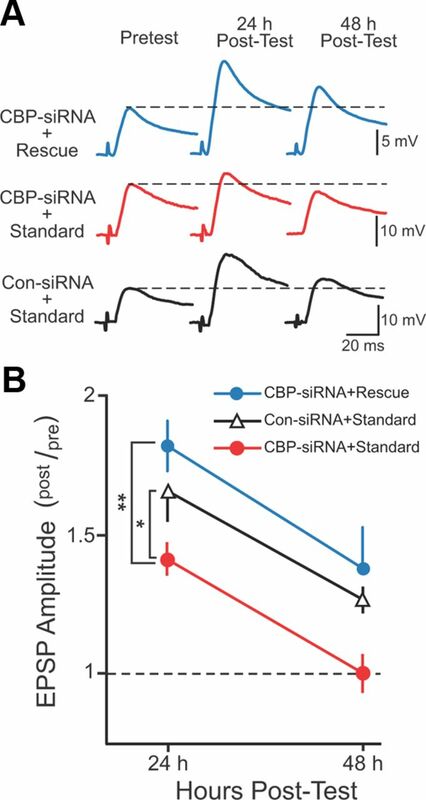 In A–E, the black traces illustrate the responses of the model to the standard protocol with control levels of CBP, whereas red traces illustrate the responses to the rescue protocol after knockdown of CBP. A1, A2, Time courses of PKA activity (PKAC). B, Time courses of ERK activity (pERK). C, Time courses of active CREB1 (pCREB1). D, Time courses of inactive CREB2 (pCREB2). E, Time courses of active C/EBP (pC/EBP). The black solid and black dashed time courses are for the standard protocol with and without CBP knockdown, respectively. 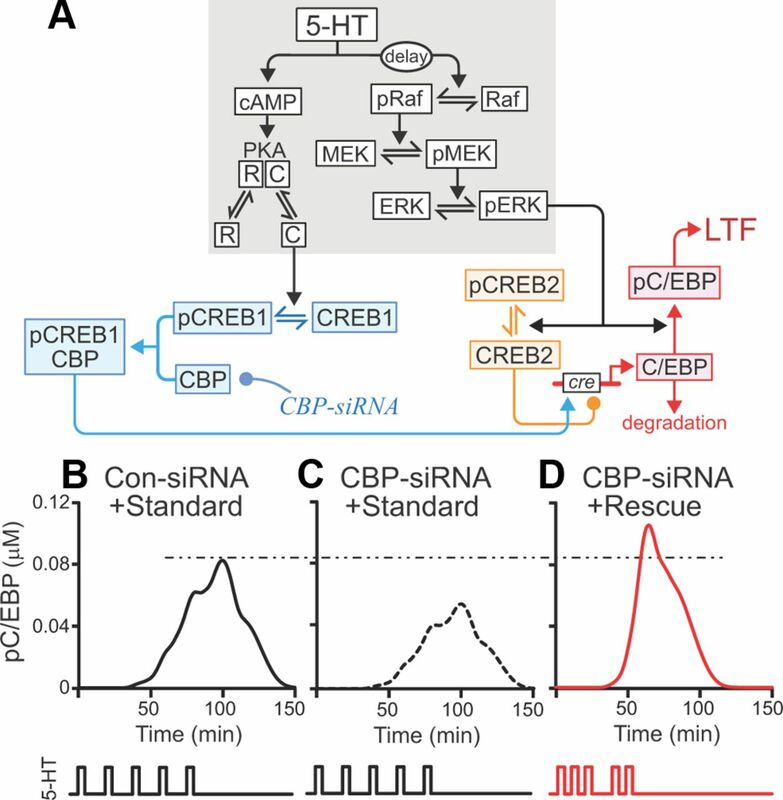 A–D do not illustrate responses to the CBP knockdown because, in the model, CBP only affects the expression of C/EBP and not the dynamics of phosphorylation of PKA, ERK, CREB1, or CREB2. F, The 5-HT pulses and ISIs for the standard protocol (black) and rescue protocol (red). The standard protocol had uniform ISIs of 20 min, whereas the rescue protocol had non-uniform ISIs of 10, 10, 20, and 10 min. Rescue protocol compensated for the CBP knockdown. A, Representative EPSPs recorded immediately before (Pretest) and 24 and 48 h after (Post-Test) either the standard or rescue protocol. SNs were injected with either Con-siRNA or CBP–siRNA 96 h before the pretest and treatment with 5-HT. Dashed lines represent the amplitude of the pretest EPSP. B, Summary data. Significant differences among treatment groups are indicated by *p < 0.05 and **p < 0.005.